The Babywearers - Family Times is an award-winning magazine with staff-written news, feature stories and artwork that inform and inspire Central New York parents and their children. When her first child was 1 month old, Faith Rayland taught herself to carry a baby in a pouch sling by visiting the website TheBabywearer.com. Now Rayland, who lives in Fayetteville, is mother of three, ages 6 ½ , 4 ½ and 1 ½ years; creator of 39 instructional YouTube videos, available on her channel Babywearing Faith; and vice president of education for the nonprofit Babywearing International, whose mission is to teach people to carry babies happily and safely, much as La Leche League supports mothers who wish to breastfeed. These days Babywearing International of Central New York, the local chapter of the group, which started with about 10 members, has more than 40 dues-paying members. Its meetings—the third Saturday of the month, 10 a.m. to noon, in retail store Basic Baby’s community room in Shoppingtown—typically have 20 families. Meetings are free to attend, and the group has a library of 60 wraps and carriers, which paid members can borrow for a month at a time. All wraps and carriers pictured can be found at Basic Baby in Shoppingtown in DeWitt. Pippa, age 17 months, is in a Maya Wrap ring sling, worn by her mother, Meghan Davis; they live in Watertown with Pippa’s father. Davis says, “Baby wearing has been helpful to get stuff done.” Pippa, who has Down syndrome, is not walking and has had to undergo heart surgery. During her recuperation, Davis was able to keep her close by wearing her in a wrap. 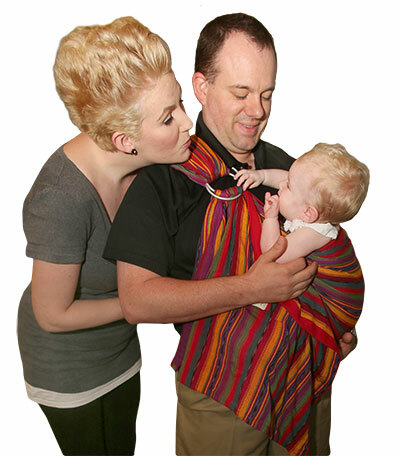 Paul Feliu holds Lily, age 8 months, in a Maya Wrap ring sling. His wife, Sarah, learned about babywearing while at Basic Baby buying cloth diapers. The couple lives on Onondaga Hill with Lily and Paul’s children, Connor, 15, Alex, 14, and Kaelin, 8—who has been known to wear Lily herself. Sarah has eight carriers of different types. “It’s like shoes,” she says. “You don’t wear high heels to run.” Different carriers are better for warmer or cooler temperatures, or are more suitable for certain activities. The most important thing about carrying a baby is doing it safely. Here are recommendations from Faith Rayland, a master babywearing educator, and Babywearing International’s website (http://bit.ly/1qL2Ogj). No article can cover every situation; ultimately you are responsible for your baby’s well-being, and your own. Anything you can do with a baby in your arms, you can do more easily with a carrier, once you get the hang of it. However, if you would not do it holding your child—cooking at the stove or driving a car—you should not do it with a baby in a carrier or wrap either. A baby must always have two fingers of room between his chin and chest. Newborns cannot support their own heads; you must position them so their airway is clear. Keeping the airway free is critical whether the child is in a soft carrier, wrap, car seat or bouncy seat. In addition, never put fabric or anything else over the baby’s face. A carrier is not a substitute for a car seat. Babies in vehicles should be strapped into appropriate car seats in the back of the vehicle, never on an adult’s lap or in a wrap or carrier. Don’t carry or wear a baby while jumping, running or engaging in any vigorous activity. (Again, if you wouldn’t do it with your baby in your arms, you shouldn’t do it while wearing the baby.) In addition, if it’s something that requires protective gear, you shouldn’t do it while carrying a baby. Wearing your baby is great for doing dishes, laundry, vacuuming or sweeping. A baby carrier can also allow you to play with your other children while holding your infant. Babywearing can be helpful when a mother is nursing. Keeping her baby close helps build the supply of breastmilk, and wraps can easily be loosened to allow the mother to nurse.